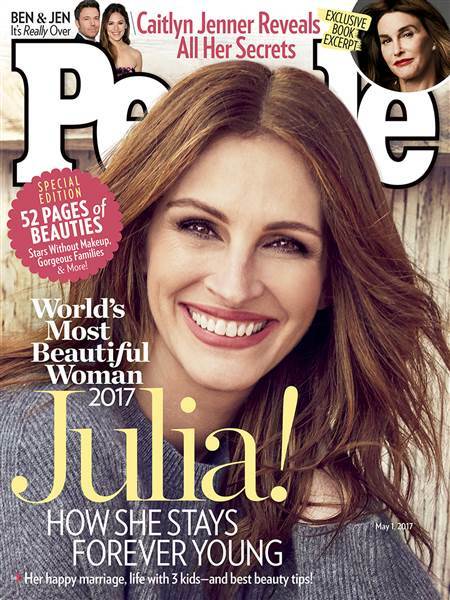 People Magazine is always one step ahead of the game, naming “People’s Most Beautiful Person” as the up and coming actress…Julia Roberts. Don’t get us wrong, Julia is a stunner and it’s good to see someone in the ‘invisible’ media age bracket win this accolade. But, she’s already flashed that famous smile on the cover several times. In 1991 it was understandable, even in 2000, but 2005 and 2010? Not so much. She’s graced 18.5% of the “Most Beautiful” covers. Are People running out of celebs? The mag needs to get out of the ’90s and add a splash of diversity. Please. Let’s just have a think about some women who would have been more relevant for the 2017 edition. Janelle Monae is at the top of our list, with her starring in Hidden Figures and Moonlight, she’s killing this year. What about Gabrielle Union? Thandie Newton? Michelle Obama? The list is endless. Woman 1: Okay, our biggest cover of the year is coming up. The Most Beautiful for 2017 needs to be awe-inspiring and revolutionary. This year has been politically and socially difficult and we should pick someone who breaks the mould. You know, a really cool and emerging talent. Woman 2: I just had an idea. JULIA ROBERTS. Woman 5: Errrm don’t we think that’s been a bit ‘done’, you know? She hasn’t been in any big films for a while. Feel like we should go for someone more relevant? Give someone else the spotlight? We don’t want people thinking we’re running out of ideas. Woman 2: Oh my gosh, we could do a subline called “pretty woman”. Woman 5: Yeah we’ve already used that. In the ’90s. Woman 3: Will it cause a PR storm though? Like everyone keeps saying we’re not very diverse. I don’t get it, personally. Like we put Lupita on the cover that one time, didn’t we?! Woman 5: How about Taraji, or Kerry, or Janelle? Woman 2: No one knows those women. Are we decided then? Julia Roberts. Woman 5: *looks at the ground and weighs up if it’s worth continuing to argue* Okay, I guess.